Welcome to 1715 and Regency England. Political intrigue abounds, the current monarch King George is unpopular with the Tories who believe James, The Pretender, is the rightful heir to the throne. George has surrounded himself with loyal subjects, the Whigs, but the Tories are plotting to usurp him. When Gideon Viscount St Mars informs his father that he wishes to marry Isabella, daughter of a Whig, his Tory father Lord Hawkhurst is set against it and a bitter argument ensues. Later that night St Mars is attacked on his way to the ball where he plans to propose to Isabella. His wounded arm bandaged, Gideon finally arrives at the ball and while he waits to speak to Isabella, converses briefly with Hester Kean, Isabella's cousin. The arrival of a justice of the peace brings Gideon the shocking news that his father has been murdered. At the same time, his cut begins to bleed through his shirt. This coupled with the argument he had with his father, means suspicion falls on him. Further circumstantial evidence leads to Gideon being arrested. Gideon concludes the only way to clear his name, reclaim his birthright and marry Isabella is to find the chap who did kill his father. Escaping from his captors with his trusty groom Tom, he holes up in an out of the way inn. The title of Lord Hawkhurst falls to his cousin Harrowby who though previously not considered wealthy enough to marry Isabella, is now welcomed as a son-in-law by Isabella's mother. After their marriage and en route to their country estate, they are held up by a dashing highwayman in a splendid blue coat. Hester recognises the rogue as Gideon and when he pretends to kidnap her, offers her help to clear his name. 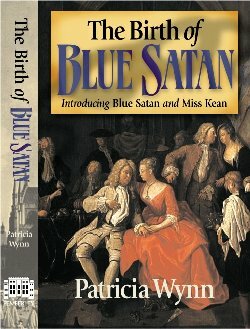 THE BIRTH OF BLUE SATAN is a fine introduction to a new series, being both educating as well as entertaining. It is very atmospheric and tightly plotted and Hester and Gideon have a delightful rapport. The identity of the murderer is a real puzzle as each possibility is investigated and rejected in turn. I especially liked the character of Hester and hope to see her get even more involved in future adventures. An extremely enjoyable read and I'm eager to read the next instalment. This book is available from the publisher at www.pemberleypress.com/ordering.htm and for a limited time as an e-book from www.belgravehouse.com priced $10.00.